Offering direct transport between your cruise ship and Central London hotels are dedicated cruise buses servicing individual cruise ships. In the direction to Southampton the bus takes a break at Stonehenge with time for you to visit this world famous monument. In the Southampton to London direction there is a choice of a direct service and a full day guided tour transfers visiting Salisbury, Stonehenge and Windsor or new Downton Abbey themed tour transfer. These services area available on all dates when a Celebrity, Crystal, Oceania, Princess or Royal Caribbean cruise ship is visiting Southampton between late April and early November. If you are travelling on another cruise line that is in port the same day as one of the above you can still use the cruise bus service but you will need to disembark and take a local taxi to another cruise terminal where a supported ship is docked. Its about 80 miles (128 kms) between Southampton to the centre of London. Between Southampton and Central London there is a wide choice of transport, both public transport and private hire, though note there are no direct shared van shuttle style services available between London and Southampton, though there is a cruise bus that is very similar. The cheapest option are the National Express scheduled buses. Full size 50 seat coaches with washrooms that depart from London’s Victoria Coach Stations. They do not go to the cruise terminals, you will need a taxi between Southampton Bus Station and one of Southampton’s four cruise terminals. The fastest option are the Southampton train services, faster than a taxi. Several trains an hour run between Southampton Central Station and London’s Waterloo Station. Like the National Express buses you will need a taxi between Southampton Train Station that is very close to the Coach Station and one of Southampton’s four cruise terminals. The only door to door shared service between your hotel in London and the cruise terminal are the Southampton Cruise Bus Shuttles. These are normally full size touring buses that pick-up and drop at all the major Central London hotel districts and go to the cruise terminals with a break half way at Stonehenge. In the Southampton to London direction the service is available direct. 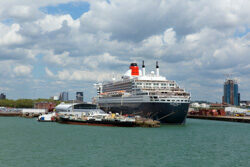 In the Southampton to London direction there are Southampton transfer tours. A proper guided tour in a luxury touring coach visiting major attractions like Windsor Castle, Salisbury and Stonehenge before dropping you off at your hotel in London late afternoon/early evening. And of course the money no object option is a private car service door to door at a time specified by you. If you have a group there are vans, even coaches available. The National Express Coaches are much slower and much cheaper than the train services. They are modern air-conditioned buses with washrooms. On a good day with a clear road, a vehicle will make London to Southampton in under 2 hours. The trains between London Waterloo and Southampton take between 80 and 100 minutes. There are no seat reservations on the trains, but unlike the National Express buses the amount of luggage you can carry on board is only limited by your ability to carry it, (don’t expect any assistance). The train station is very near Southampton Coach Station, so just like the National Express coaches you need a taxi between train station and cruise terminals. The terminus in London for the train is London Waterloo on the south side of the River Thames. Again Waterloo can be a long way from many hotels, there is a more exotic non-direct route from Paddington Station in London, which may be much closer to your hotel avoiding a very tedious trek across London with luggage. Of course private cars and larger vehicles are available. You select what time you want to depart. Vehicles all the way from saloon/sedan cars to large coaches are available. Note, with cruise transfers, more often than not it is the amount of luggage that determines the size of vehicle required, not the number of passengers. With a clear road, London to Southampton is about 2 hours but London’s roads are congested. Its quite important you budget adequate contingency time . If the motorway is congested or there is an accident, alternative routes are much, much slower. Nearly all cruise ships have assisted disembarkation between about 7 a.m. and 08:30 a.m. During weekdays, transfers into London and its airports have a high probability of road congestion delays at the tail end of the morning commuter traffic once you approach the Heathrow area and the turn-off for Gatwick. Going towards Southampton its not so bad, but if you are travelling on a summer Saturday, the road down to Southampton can be at gridlock in the morning as half of London makes for the beaches.